Sweden, Israel and Armenia are my faves. But the victory has been set up for Italy. Gaming and the Eurovision constest are a little bit no no, I am too old!!!! Can't beat a good game. Even though good ones seem few and far between these days. My favourite of the ones you've listed is Sweden. Sorry! The others all seem a bit boring to me. Nice to see at least 2 videos featured my car, the Wrangler Jeep! Ha. Out of your picks, I'd say Israel was probably the best. Those Dutch girls are really cute though, especially the blonde on the right. Eurovision !!!! i cant wait to see who wins the title this year! The phenomenon of Eurovison is amazing, since it is very little talked about here in the States. Ahh, I LOVE watching Eurovision! I always order in a massive pizza and work my way through it over the night haha. Thanks for sharing your fave songs, I'll keep them in mind when watching it! Uncharted 4... another gem I can't play because I don't have a PS4. I did love Witcher 3, though. Way more fun once you really get into the meat of the game. That's going to be fun! i never really did much gaming so. hehe. i'm a bit lost. 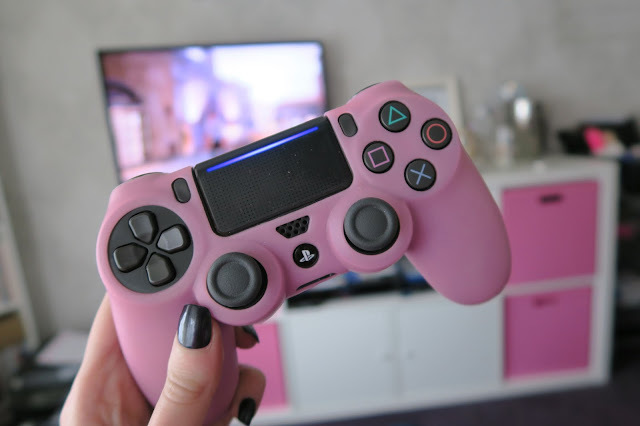 Your controller is so cute! Então estamos quites, porque eu não sei falar inglês muito bem! hahaha! Seu controle é muito fofo! Você pelo jeito é uma grande jogadora. Adorei o seu top 5 do Eurovision!